We recommend leaving Windhoek early this morning as you have a 435km drive to complete before reaching the park. 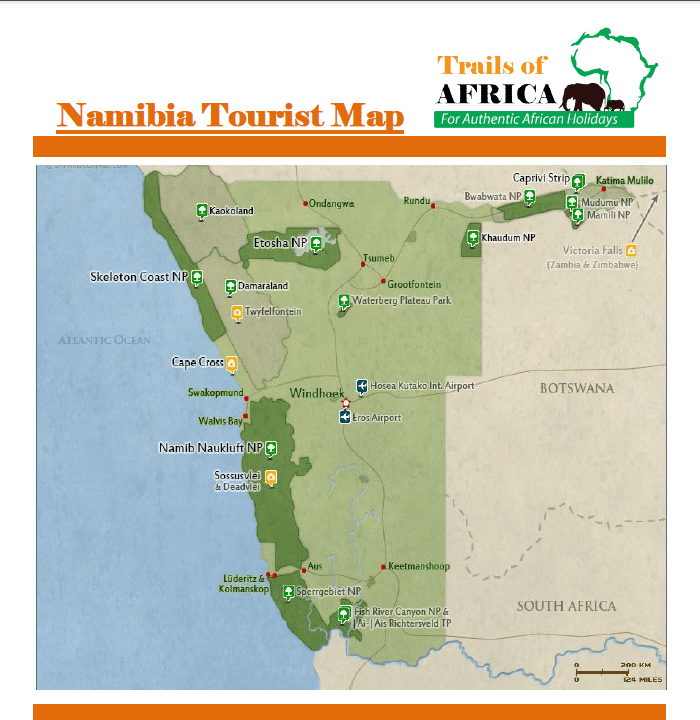 Your route takes you due north of Windhoek via the towns of Okahandja, Otjiwarongo and finally Outjo (a popular lunch stop – before the final drive into the park). You will enter Etosha at the Anderson Gate from where it is only a short drive to Okaukuejo. The chances are that immediately on entering the national park you will start to see interesting wildlife – so covering even the shortest distance can be a rewarding and time consuming business. Do remember that you have to be inside the Okaukuejo gates before sunset. As darkness descends you can make your way to the spot-lit waterhole and watch the animals come down to drink. This waterhole is frequently visited by rhino & elephant as well as numerous smaller nocturnal game species. It is really worth waking early and heading out on your game drive as soon as the gates open at sunrise. Animals are most active in the cool of the day (early morning & late afternoon) and in order to maximise your chances of good viewings it is worth imitating their behaviour. The roads in Etosha are unsealed gravel roads but are in reasonable condition – and the general tourist behaviour is to drive between various waterholes searching for animals. These two nights accommodation are at a comfortable lodge on the eastern outskirts of the park. From here is is only a short drive into the park and an added benefit of staying here is the option to book one of the lodges guided game drives into the park. There is time for a last game drive this morning before you need to head back towards Windhoek. Drive via the towns of Tsumeb (just north of the town is the Otjikoto Lake which is worthy of a short visit) & Otavi before rejoining the route you used while travelling north in the town of Otjiwarongo. Whichever route you decide to use, do stop at one of the wood carving markets in Okahandja as this is the best place to purchase Namibian wood carvings.